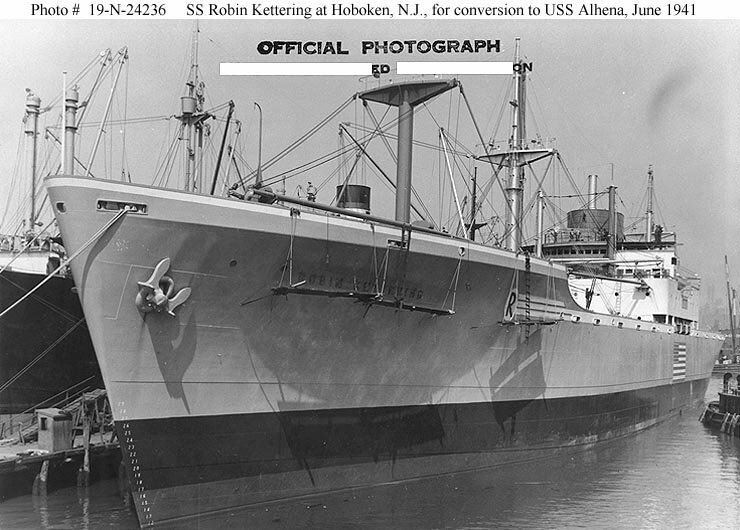 Laid down, 19 June 1940, as SS Robin Kettering, a Maritime Commission type (C2-S) hull, under Maritime Commission contract (MC hull 74), at Bethlehem Steel Co., Sparrows Point Yard, MD. 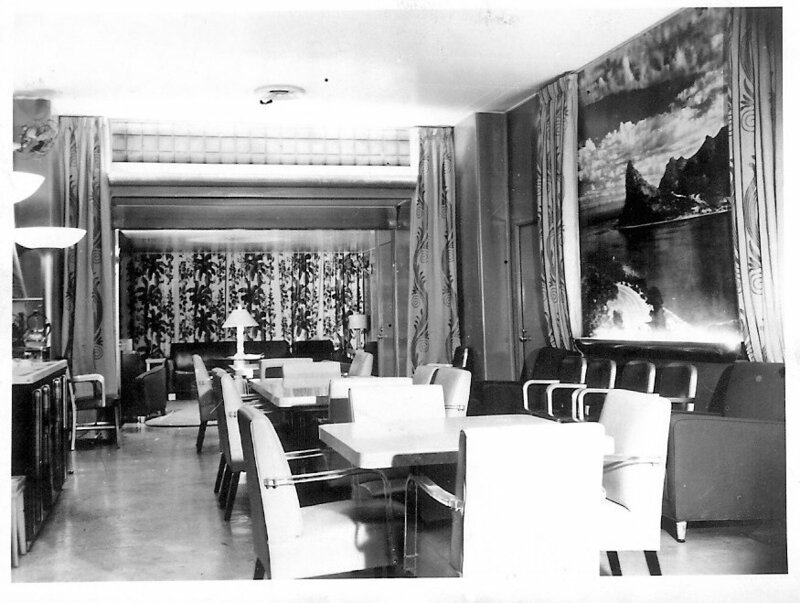 Purchased by the Navy, 31 May 1941, from the Robin Line of the Seas Shipping Co., New York City, N.Y.
Decommissioned, 22 May 1946, at Bayonne, N.J. Delivered to the Maritime Commission, 12 September 1946 for lay up in th National Defense Reserve Fleet, Hudson River Group, Jones Point, N,Y. 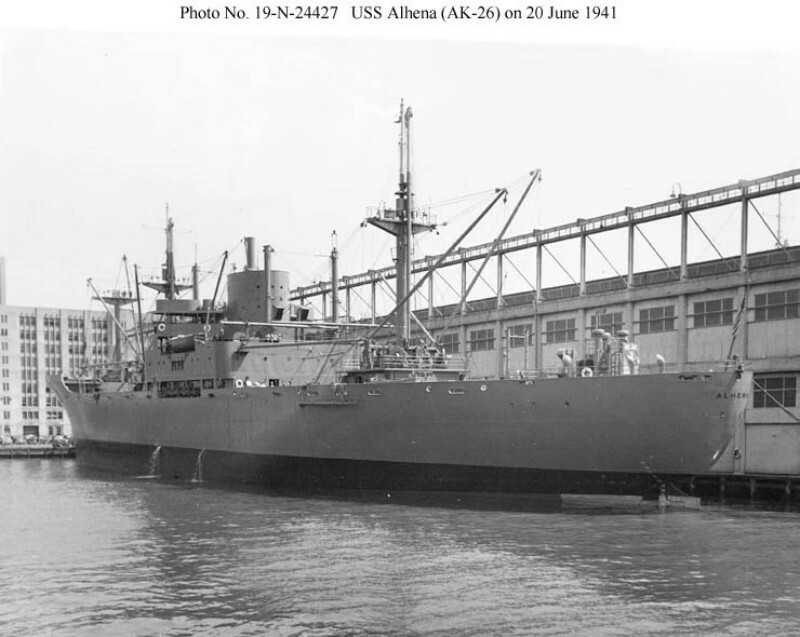 92k SS Robin Kettering, at Tietjen-Lang Dry Dock Co., Hoboken, NJ, undergoing conversion to Navy ship, Alhena (AK-26), 6 June 1941. The upperworks have been partially painted over with probable Measure One camouflage, and stages have been rigged for removing the civilian name and company markings on the hull. 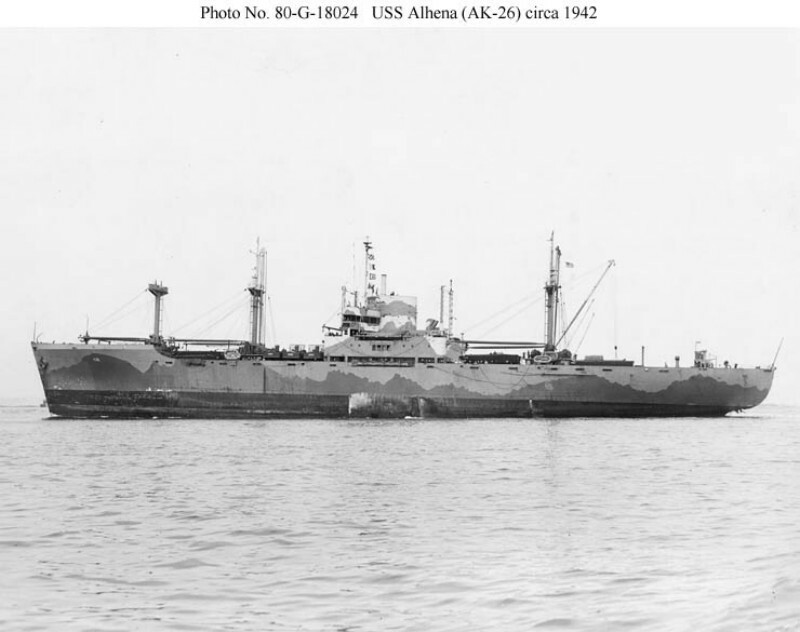 95k USS Alhena (AK-26) moored, 20 June 1941. Her conversion appears complete and the ship is in commission. Typical of most AK conversions of this period, she lacks any armament. 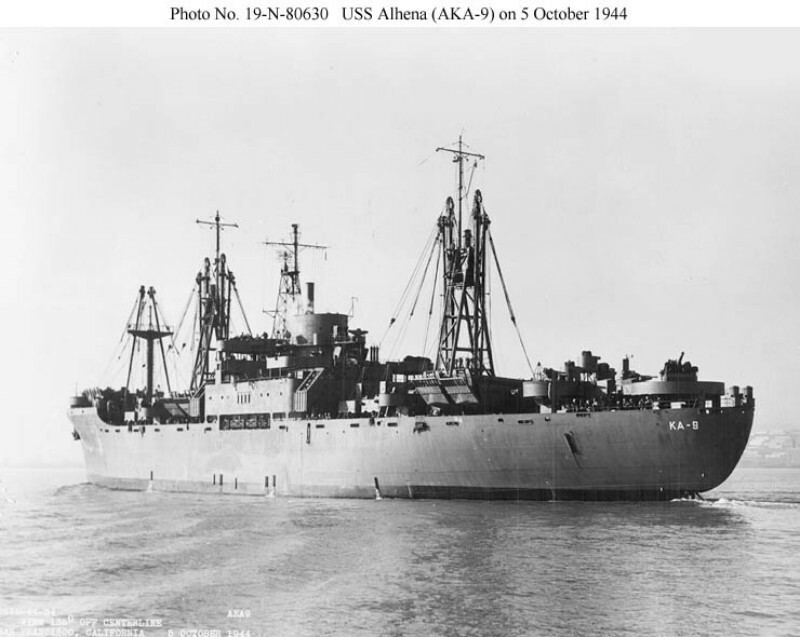 80-G-18024 67k USS Alhena (AK-26) barely making way. 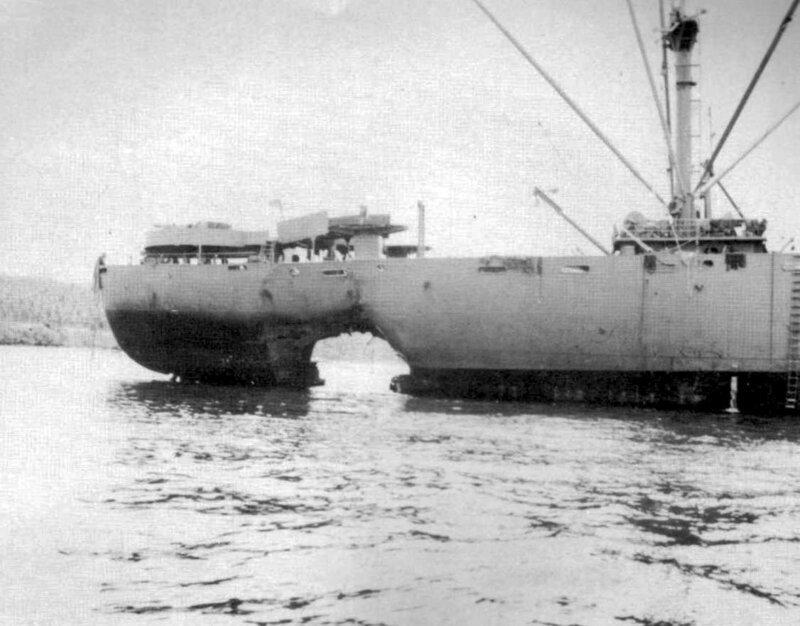 circa early 1942 before installation of her armament. Note the camouflage is now Measure 12(modified). 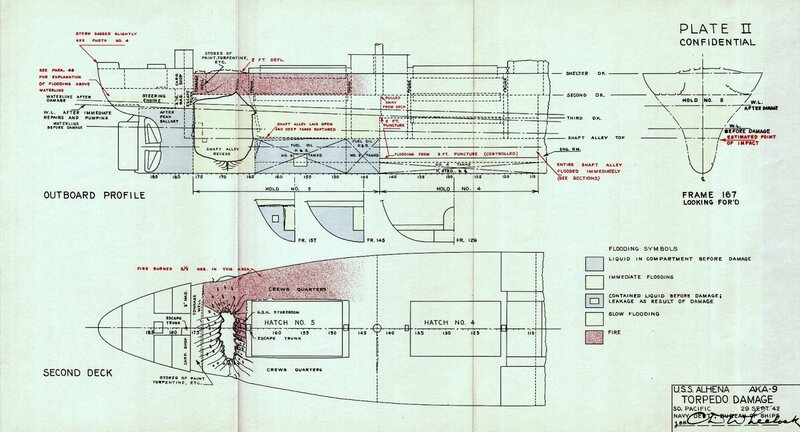 264k Battle damage diagram of USS Alhena (AKA-9) from submarine torpedo explosion on 29 September 1942, twenty miles south of San Cristobal Island in the south Pacific. 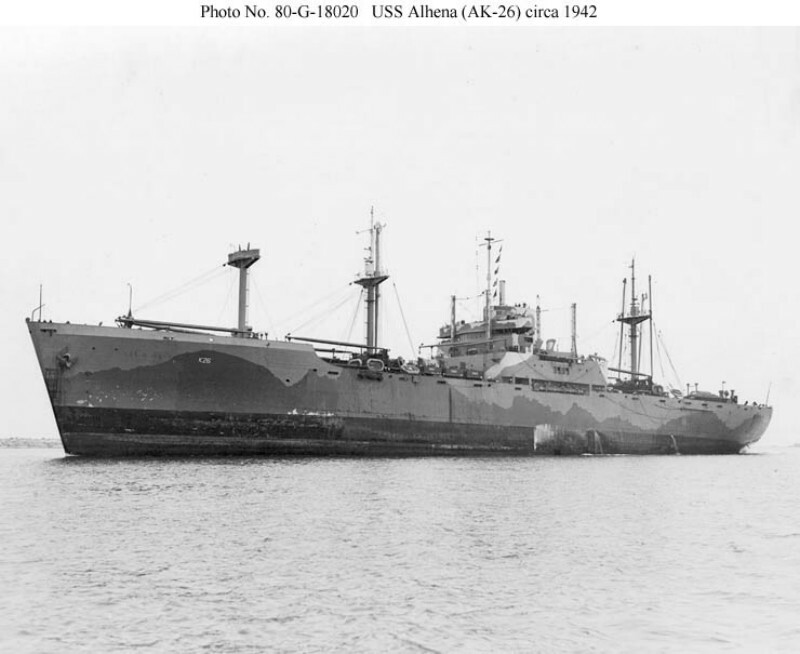 Note, although Alhena was still designated as a cargo ship (AK-26) when these photos were taken the Bureau of Ships War Damage Report describes the ship as the attack cargo ship (AKA-9). 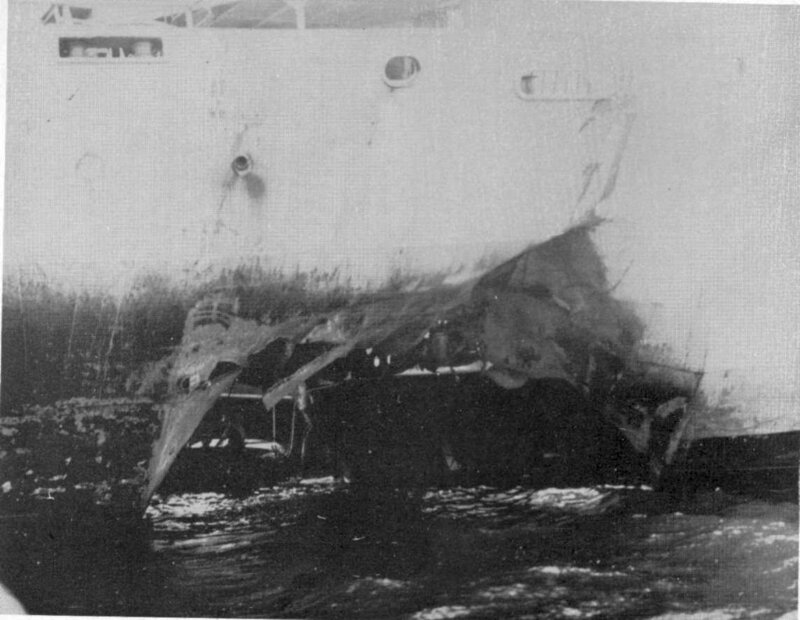 126k Starboard side view of hull shell damage to USS Alhena (AKA-9), as seen at her arrival at Espiritu Santo for temporary repairs. Note, abrupt cutting off damage by full peak tank just aft of rupture and the definite sag in the stern. 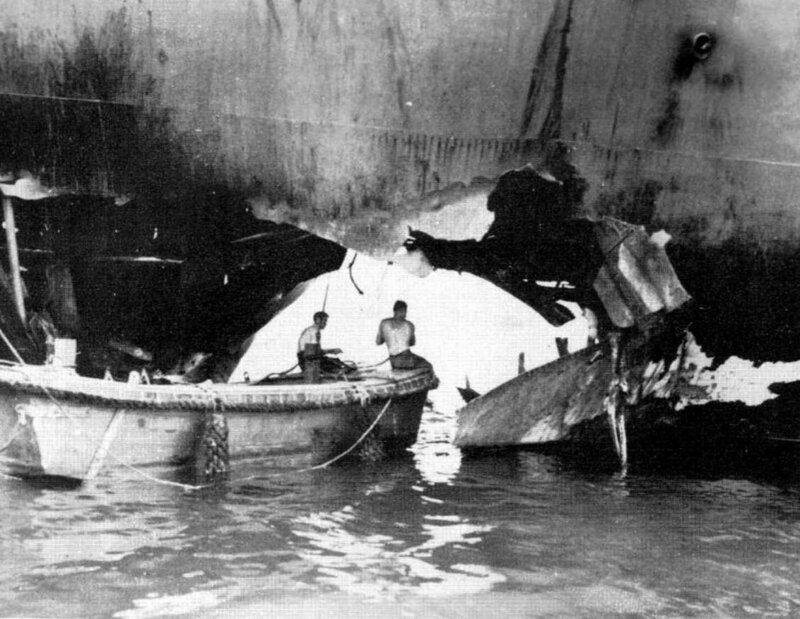 168k Torpedo damage to USS Alhena (AKA-9), port side view showing hull shell damage upon arrival at port after being torpedoed 29 September 1942. 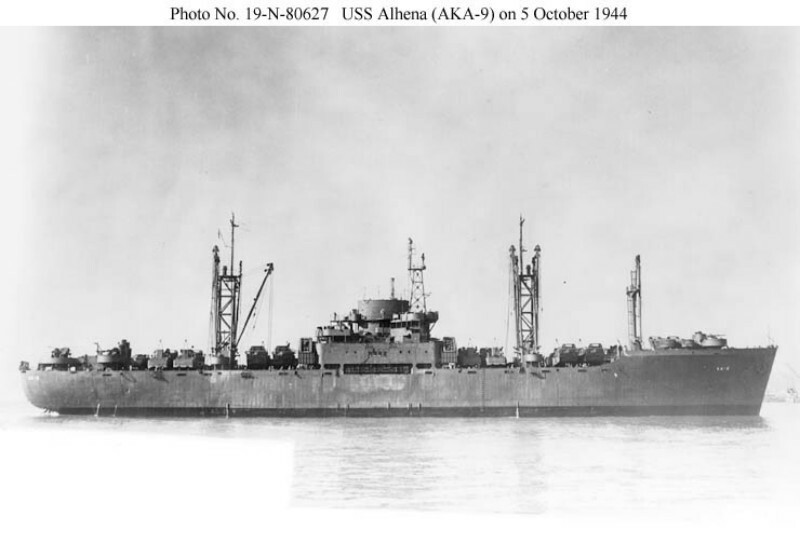 105k Port side general view of USS Alhena (AKA-9) in port with temporary repairs in progress. The stern has been raised by shifting fuel oil and ammunition forward. Note, the unidentified AT alongside. 143k Seeadler Harbor, Manus, Admiralty Islands, 10 November 1944. Small craft gathered around USS Mindanao (ARG-3) during salvage and rescue efforts shortly after USS Mount Hood (AE-11) blew up about 350 yards away from Mindanao's port side. 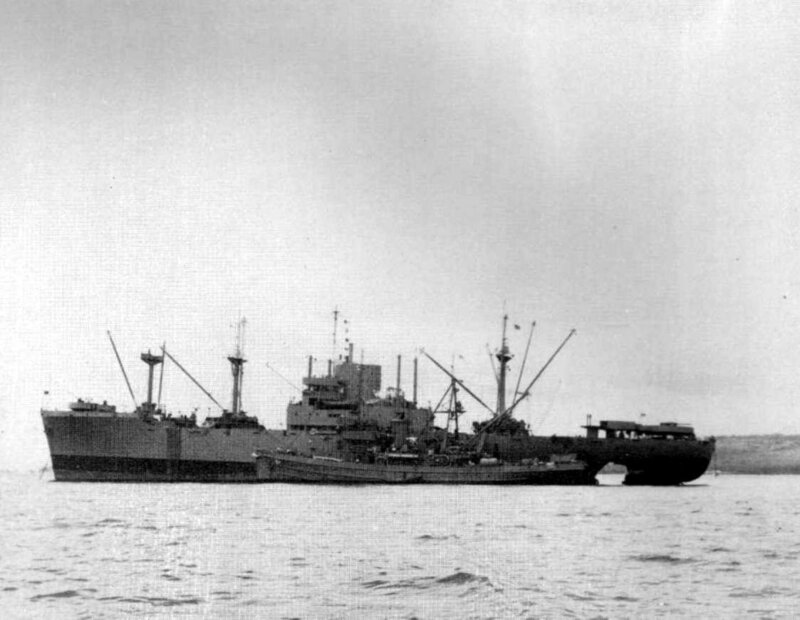 Mindanao, and seven motor minesweepers (YMS) moored to her starboard side, were damaged by the blast, as were USS Alhena (AKA-9), in the photo's top left center, and USS Oberrender (DE-344), in top right. 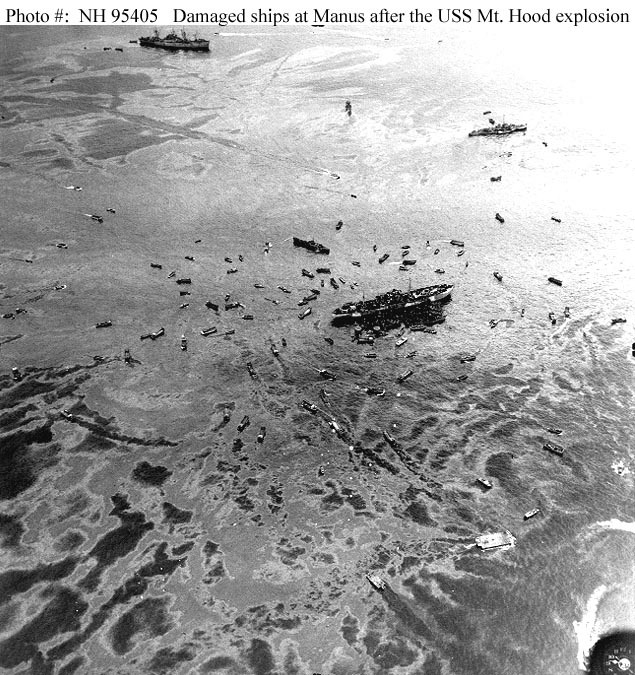 Note the extensive oil slick, with tracks through it made by small craft. 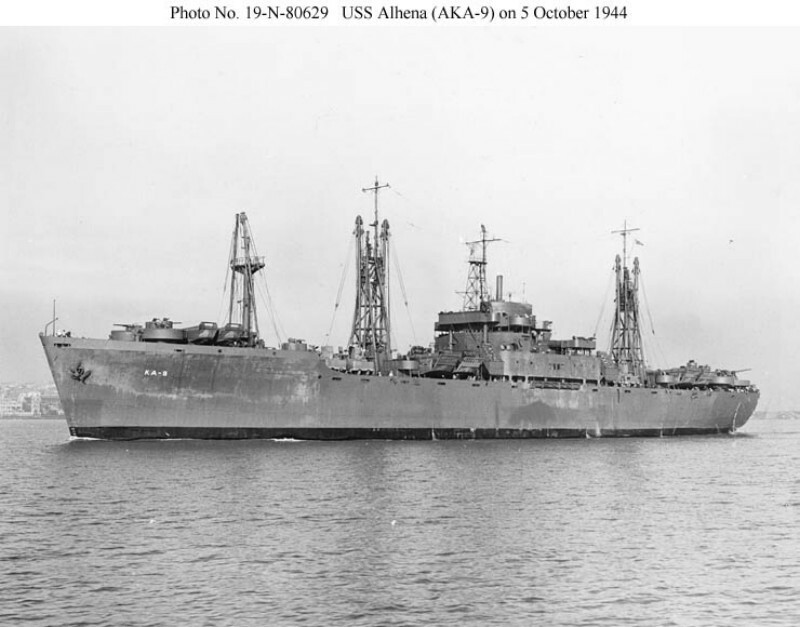 43k USS Alhena (AKA-9) underway, date and location unknown. US Navy from "All Hands" magazine, February 1950. Joe Radigan MACM USN Ret. 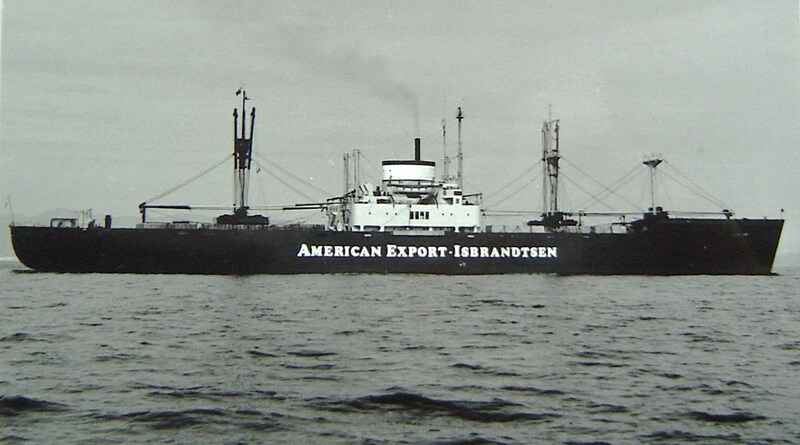 Merchant Service American Export - Isbrandtsen Steamship Co.
239k Ex-USS Alhena (AKA-9) in service as the American Export-Isbrandtsen Line cargo ship SS Flying Hawk, circa 1966, location unknown.